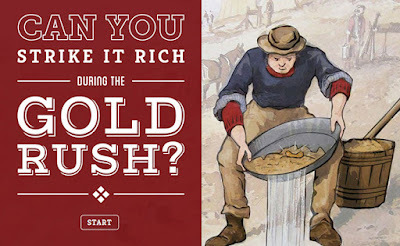 Mr Rees' Class Blog 2017: The Gold Rush Game: Can you strike it rich? DO YOU HAVE THE LUCK AND KNOW HOW? AIM OF THE GAME: To strike it rich! RULES: Every player starts with 100 points. You pay 10 points each time you take a turn. You will face a number of challenges and you must decide the best thing to do. You will win or lose points based on the wisdom of your decisions - and how lucky you are! The winner is the player with the most points at the end. Good luck!